San Diego Deputy District Attorney Garret Wong, a DA team captain, runs his leg of the Baker to Vegas Challenge Cup Relay race.San Diego County Probation, District Attorney and Sheriff teams competed against hundreds of other racers in the grueling 120-mile Baker to Vegas Challenge Cup Relay. The annual law enforcement challenge was held March 17 and 18 this year and included 275 teams from throughout the United States and other countries. The race started Saturday morning and continued overnight until the 20-person teams completed the 120-mile course. Those teams that finish in the top half of their category win a large, glass race mug – and bragging rights, of course. Historically, runners have endured scorching temperatures as they race through the desert, but this year temperatures were in the mid-60s, with cold winds in the day and even chillier at night, with temperatures dipping to the mid-30s. The San Diego County Probation team ran in the mixed category which included 15 men and 5 women, all of whom are sworn officers. The team time was 16 hrs. 16 minutes and 15 seconds. They came in seventh place in their category and in 79th place overall. The San Diego County Probation Baker to Vegas running team poses with Probation Chief Adolfo Gonzales who cheered them on at the beginning of the race and was there to greet them at the end. Probation Division Chief Alex Zermeno said five of the team’s top runners were unable to compete this year. This is the 22nd year that Probation has competed in the race. Zermeno said the conditions were “totally opposite” of the brutal heat. He said runners were trying to stay warm as they waited for their leg of the race, but the winds made it difficult. Division Chief Alex Zermeno, on left, said he thought it was a nice touch that the race organizers honored the victims of last year's Las Vegas shooting with markers along the course. Despite an unusual year, Zermeno said Baker to Vegas fosters camaraderie between the law enforcement departments participating and certainly within their own department. The San Diego County District Attorney team ran in the Invitational Category. Racers included District Attorneys, investigators – even a retired one, facilities crew, and support staff in the department. They finished the race in 16 hours, 46 minutes, and 46 seconds placing 12th in their category and 117th overall. This is the DA Office’s 20th year running in the Baker to Vegas relay. 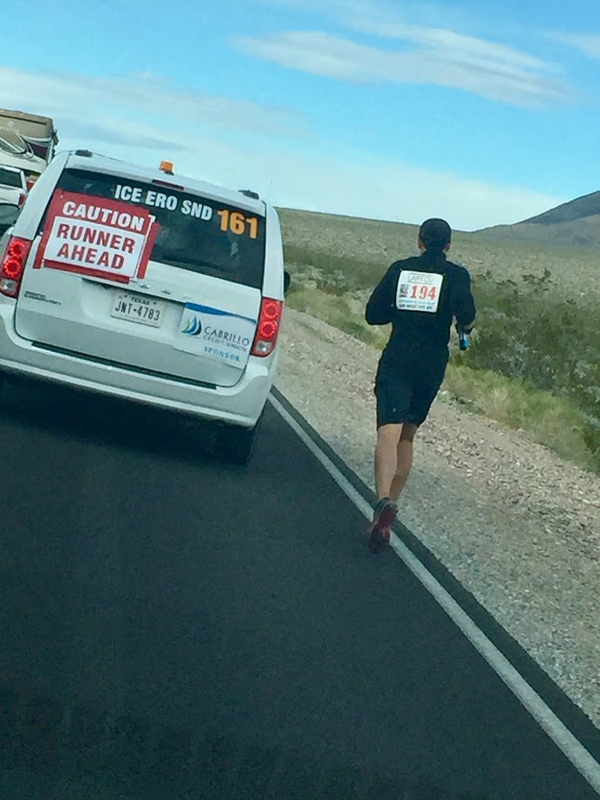 The San Diego District Attorney's Office Baker to Vegas team ran in honor of two late colleagues.One of the three team captains, Chris Campbell, said the cold weather was a new challenge. He said those who ran between the hours of 8 p.m. and 4 a.m. had to bear close to 35 degree weather. Campbell said this year the team also ran in honor of two late members of the DA’s office, Deputy District Attorney Lisa Moffatt and District Attorney Investigator Brett Burkett. The San Diego County Sheriff’s Department ran the race in the Open Category. The team’s finish time was 14 hours, 29 minutes and 52 seconds. They placed ninth in their category and 14th overall. A Sheriff's team member passes off his leg of the relay to another member during the nighttime portion of the Baker to Vegas race. "The team ran 23:08 faster than in 2017, the fastest time for the Sheriff's Department. Almost every veteran runner bettered their run times from the year before," said Sgt. Denese Deal, team captain. "Temperatures went below freezing during the night and in the mountain. There was even a sighting of snowflakes coming down when we reached stage 15." The San Diego County Sheriff's Department Baker to Vegas team had a strong finish of 14th place overall. Volunteers played a critical part in helping local law enforcement compete in the event, both from within law enforcement and from other departments. The Department of Animal Services (DAS) didn’t send any runners to the race but staff members and volunteers certainly did their part to support the event. 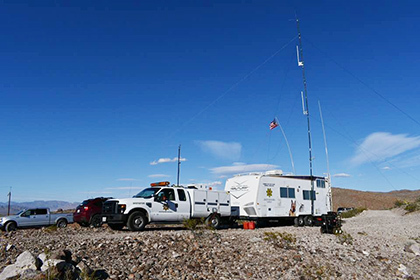 While all of the racers were competing, the DAS contingent was high above them on a windswept mountain peak using the DAS disaster trailer to serve as a communications relay point for the race. The County DAS disaster trailer was positioned above the runners to support communications.